The good thing about running a website about Mark Knopfler and his guitar sound and style is that you get in touch with so many other people who share your interest. I guess everyone who is really interested in this topic sooner or later finds his way to this site. So it happened that one day a customer who bought two of my iSounds in my online shop told me that he owns quite a lot of guitars, one of them being the Schecter S8001 – that sunburst Dream Machine Strat that probably everyone of us knows from his teens on, the guitar used in e.g. the Alchemy video on songs like Tunnel of Love or Telegraph Road. The guitar was auctioned at Eric Clapton’s Crossroads charity for more than 50,000 USD in 2004 (Note: The owner now – let’s call him O. for owner – is not the person who won the charity but got the guitar later from him). As O. lives only a couple of hours by car from my place, the idea to visit him came up automatically. So it happened that I went on a short trip to his place a few weeks ago. O. is a huge MK fan and a guitar collector. I can tell you his collection is beyond being amazing :), including lots of vintage Fenders, Gibsons, and Schecters, also many amps, and much more. I guess you can easily imagine that the moment when O. opened the guitar case was very special for me. The guitar still looks as it did when we saw it the last time, on the pictures for the Crossroads auction in 2004, and thus pretty much as it looked in 1986 when we saw it on stage the last time. The condition is great, not much worn after being played on so many Dire Straits concerts, with exception of the gold plating on the pickguard. This is a problem of all the golden vintage Schecter pickguards. Applying a gold plating to something as big as a pickguard is extremely expensive, with the gold price itself being the relevant cost factor. Gold plating is the more durable the thicker the coat is, which means a 5 micrometers coat is 10 times more durable than one of 0.5 micrometer, but unfortunately also 10 times as expensive – and we areeasily talking about hundreds of dollars (!!) just for the gold here. This is the reason why already on Alchemy – two years after Mark got the guitar – the pickguard was worn at the places where Mark used to rest his right hand. I was allowed to play the guitar. I played some expensive vintage guitars in my life, so touching a 50,000 dollars guitar was not such a problem (of course you must not think about what would happen if you accidentally drop the guitar …). It had been in the case for some time so it was totally out of tune. After tuning it we plugged it into a Tone King Imperial. It is a really great sounding guitar, with a very warm and full sound. The question which probably comes up automatically is, do you sound like Mark on Tunnel of Love or Telegraph Road just because of the guitar? Well, the answer – you can probably guess – is ‘no, not really’ – it is all in the fingers and the rest of the signal chain. If you have a blindfold on your eyes and someone plays the guitar, you will not say ‘That’s the one from Tunnel of Love‘. 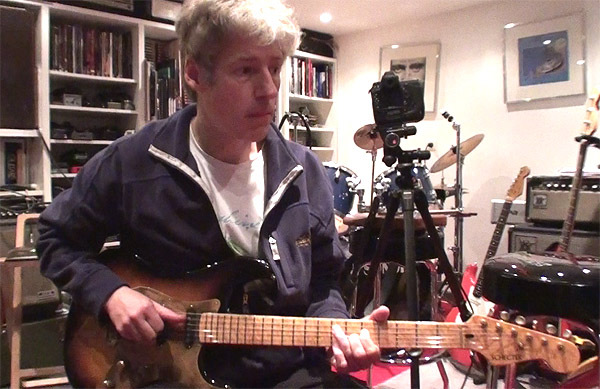 But – the other way around – after playing the guitar I can often hear the same tonal characteristics on the old recordings with this guitar, e.g. a particular warmth or a typical sustain. The guitar is not a lightweight – it is from a time when heavy wood and brass parts were considered as superior – and in fact these ingredients cause a special sound. I took many photos of the guitar. Unfortunately I cannot publish these, especially detail photos. The reason is that O. is afraid of giving food to people who fake vintage guitars – here he is not thinking of people ‘like us’ who might make a luthier build a clone of Mark’s Schecter to play with a tribute band but of those who sell fakes as real stuff on ebay. I could convince myself that this is in fact a serious matter when he showed me one of ‘my pickguards‘ that was sold to someone as a real vintage Schecter pickguard (and my pickguards are really not intended to fool someone, e.g. the pickups all have the manufacturer’s label on the bottom plate but these were simply sanded off !). Still I can show you two new pictures of the guitar in this blog post – please don’t ask for more. When I was fifteen and saw this guitar for the first time during my first Dire Straits concert, I would not have believed that one day I will play on it myself. Check out this blog post that features some videos in which you can watch me playing the guitar. Thanks to Mr O for arranging this viewing and for you providing more detail for us Knopflerites! Anything more you can publish will be greatfully recieved, what a guitar! Now I may be ordering more loaded pickguards from you to build my own!! Wow Ingo, what a great opportunity. My interest for Van Nuys Schecters has reduced over the years because they are so scarce and I’ve gotten to prefer tone (i.e. Fender) over sustain (Schecter). But I’ve always wondered what it is like to play a genuine Van Nuys Schecter. It seems that MK found them easier to play than his Fenders. 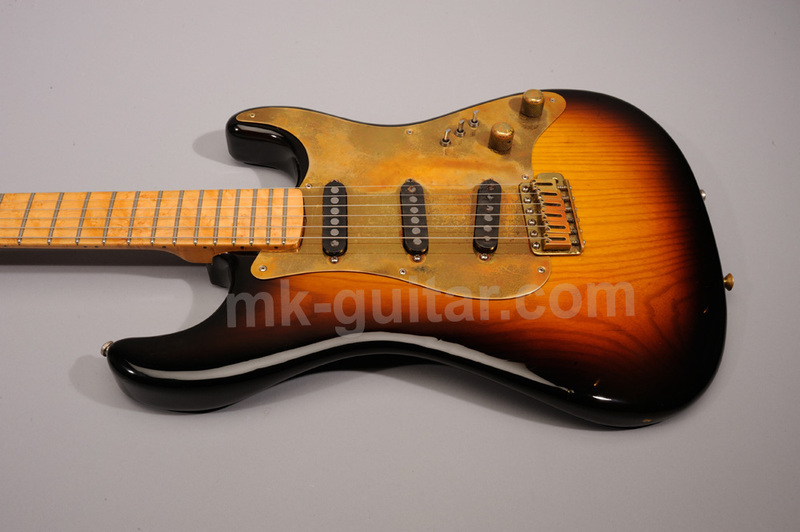 Could you share your experience with the playability of this guitar? Playability: It was not hard to play, but everyone plays probably best on his own main guitar, the one you are used to, like driving your own car. I would not say that the guitar – for whatever reason – was better to play than the ones you normally put your hands on, it was allright but not spectacular with respect to playability. 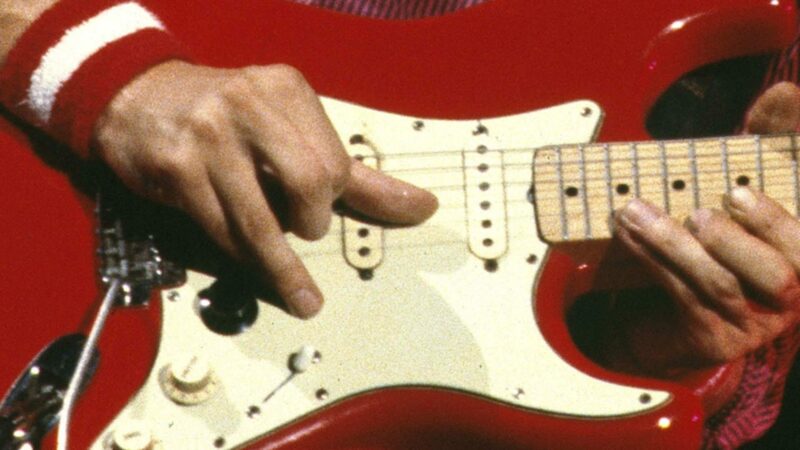 I agree with you that one reason why Mark changed from his red Fender Strats to Schecter in the early 80ies was playability, but I’d rather imagine that his Fenders were probably not the easiest guitars to play. Possibly many modern guitars are better to play than these. you didn’t say how did you feel to put your fingers on a same guitar as Mark ? I can’t realise if I would be able to do the same ! this guitar looks gorgeous IMHO, and I always thought that Mark choosed this one for “dark-epic” tones, from TR to RATR. I find it’s a shame it has been replaced by the pensa, in a way. It is surely a special moment to play such a guitar but it was not that I had shaking arms just because of nervousity. Similar to the question what would it be like to meet Mark and talk to him, I’d also say that I would not lose my voice, faint 😉 , or such, but could talk freely to him – in a way a celebrity is also an ordinary person and this is also an ordinary guitar – probably it is best not to start to think too much in such a situation. how can I put my avatar pic on comments, just like on forum ? a) The standard way is to have a “Gravatar”, a globally recognized avatar. Register at gravatar.com with the email you use here, then upload an avatar there. This avatar will then be displayed in all blogs and forums in the internet that support gravatars. The idea is that you don’t have to upload an avatar for each forum or blog, but have only one that is associated with you in all forums. If you want a special avatar let’s say for guitar forums, and another one in other forums, you can register with different email addresses at gravatar and use these in different forums. Could you please give us more details about what did you feel about the neck of this amazing guitar? Did you feel it as a C, V, D or U shapes? MK Strat it is supposed to be a C shape. How does it feel the Schecter’s neck compared to the MK Strat’s? And what about the fingerboard radius? Do you think it is 12″? And what about the tapper? 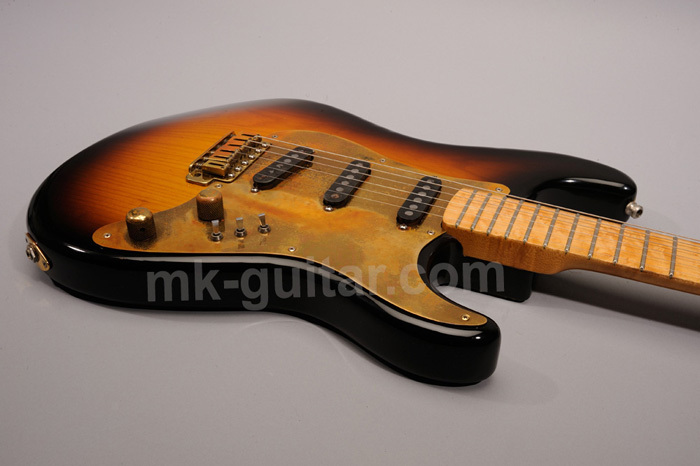 Is it slimmer compared to the MK Strat? The current fret wire looks like jumbo. Or is it more like the Dunlop 6105? Hard to say if the neck was rather C, D, U,… well, it was not V for sure. It was not extreme in any way, neither very flat nor fat, I remember it rather round and average, so something between C or D (?). The width at the first or last fret was also standard I’d day. The fingerboard is flatter than a vintage Strat (which is 7.25), I’d guess about 9.5 – 11 maybe, it did not seem too flat either. Mark used Jumbo 6110 frets in the 80ies, I myself have 6105 on most of my guitars, so I think I can tell with certainty that these are still 6110. There was no strong fret wear. What do you mean with tapper? Thanks for your reply. You have already answered the question about tapper. I was referring to if the guitar neck was too flat or fat. you are one lucky guy. my favorite strat tone came out of this guitar. but you haven’t said anything about the acoustic sound. is it dead? is it brigth? you say it’s heavy, is it just on heavier side or is it a boat anchor? and, as Eduard, i too would like to know what radius is. What an amazing experience getting to play one MK’s guitars but an even better experience to play one of his Schecters. I have developed a bit of an obsession with his Schecters over the years. I don’t suppose you noticed if the logo was just black or black with gold edging? Just wondering how high/low the action on the guitar was?? MK always makes playing look so effortless that I’ve assumed that his guitars have a low action. But I’ve also heard of great guitarists who’s guitars aren’t the easiest things to play (which further underlines how good they really are). The action was not extremely low I’d say, and not high either. However, I don’t know if it was still set up as it was when played by Mark. Hi Ingo, what an amazing opportunity. I’m trying to get the cash together to build/buy a replica of this guitar. Tell you what, my hands would have been shaking! Imagine if you got to play it through one of the Jim Kelley amps in your other blog post. Keep up the great work, Pete. PS next you’ll be playing the stolen Sunburst Schecter! My personal dream is to find the red maple neck fender one time, the guitar that made me start to play. I have just watched your video playing the S8001 distorted (http://www.youtube.com/watch?v=ij-6RSLJwBE). This distortion comes from the ToneKing on lead channel or there is an overdrive pedal in between? The amp on the videos was a Tone King Metropolitan, no effects. There was an Imperial as well in the room but it was easier to get a distorted sound at low volume with the Metroloitan. do you know what finish the neck had? Sure, it was clear nitro laquer. clear gloss or clear satin? Your site is amazing, And that guitar is incredible, Always wondered what happened to that guitar have not seen it since i wore out my vhs recording of the bia tour at wembley, And then i check out your site and you show up with it lol. Does mr o play guitar himself? If so what is his impression of it? And would you ever consider owning it some day? Again amazing site and info.